find it hard to make people laugh. But for some, it comes naturally. 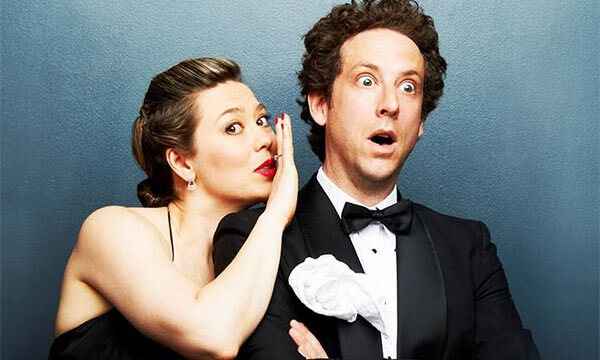 This clever couple has been working hard to put Canada on the map in the world of comedy. It takes more than a funny bone—or two—to make it in Canada’s competitive comedy industry. But for Naomi Snieckus and Matt Baram, their collective skills have helped them become the hilarious “it-couple,” taking on the challenge one scene at a time. You may recognize them from your television screens. Matt stars as the nerdy character Jonathan in the Citytv show Seed, and Naomi can be seen as Bobbi, the no-nonsense teacher, in the CBC comedy series Mr. D.
It’s never a dull moment, on stage or off, when it comes to the lives of these two actors who are masters of the art of improvisation. For them, there is no off-switch. such a fast-paced environment that feeds off of captivating an audience and playing with emotions. He eventually auditioned for a role with the Second City Comedy Theatre, one of Toronto’s legendary improv hubs. It was there that Naomi and Matt first crossed paths. Naomi graduated from the Ryerson Theatre School, where she discovered her passion for acting and never looked back. “It was exactly what I wanted to do,” she says. Later, when Naomi landed a position with Second City, she knew she chose the right career. Naomi and Matt ended up working on five shows together, with Second City, where they established their undeniable chemistry and made lasting connections and industry relationships. In 2008, they founded The National Theatre of the World (along with Ron Pederson), a nonprofit, Toronto-based theatre company. They specialize in improvisation and work hard to create exciting and provocative theatre. The company puts on various shows throughout the year; some of its productions include I Seen You on TV, Baram and Snieckus and The Script Tease Project. They also hold workshops and drop-in classes. But can anyone turn an act of telling jokes into a career? “Everybody’s got the muscle to be funny,” says Naomi. “It’s just the matter of exercising it.” But you have to take initiative, the couple agrees. Don’t wait for opportunities to come to you. Make things happen! Naomi and Matt are perfect proof that success, and a lot of laughs, comes in good company.